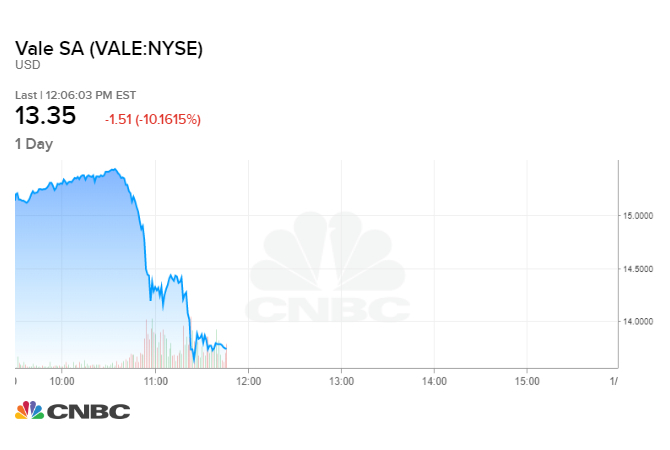 Shares of mining giant Vale plunged after the company reported a breach at an iron ore mine in southeastern Brazil that sent mud flowing into a neighboring community. AFP reports there are “several” deaths in an area outside of the city of Belo Horizonte, citing a local fire service official. A statement by Vale said there is no confirmation of any injuries. CNBC could not immediately confirm the report of fatalities. The stock price for the ADR traded in the U.S. was last down more than 10 percent at about $13.30 a share. The incident occurred at Vale’s Feijao Mine in Brumadinho in Minas Gerais, the state that neighbors Rio de Janeiro. According to Vale, byproducts from the mining process have reached the company’s administrative area and part of the community of Vila Ferteco. Byproducts from mining, known as tailings, are kept in tailing ponds near mines. Photos and videos on Brazil’s G1.com news site show torrents of mud flowing near the site and damage to residences. Residents in the lower district of Brumadinho are being evacuated, according to the news site operated by Grupo Globo. BRASILIA, Jan 25 (Reuters) – A Brazil fire brigade said it is searching for about 200 people still unaccounted for following a tailings dam burst at an iron ore mine owned by Brazilian miner Vale SA on Friday.